As financial institutions face dramatically higher regulatory fees and greater scope of oversight, compliance risk has become a pronounced concern for the executive leaders of financial institutions. Disengagement during trainings risk employee misunderstanding of how to act compliantly, which can result in financial and reputational damage. Developing compliance training programs with clear learner engagement and learning retention objectives has become imperative. The most effective compliance training design models rely on three core principles to address these challenges. The following practical actions can help employee learning and compliance leaders avoid the dangers of disengagement during regulatory compliance trainings. Regulatory mandates affecting the financial sector are notoriously complex. Employees often question the necessity of mandatory compliance trainings, and leave traditional lecture-style trainings unclear of how regulatory changes affect their decision-making. Audience response systems are interactive educational tools that enable training educators to personalize the learning process for training participants. Live polls on how employees should respond to common scenarios get learners considering the real-life implications of regulatory changes. Role-based quiz scenarios encourage a healthy debate on situational dilemmas and heightened understanding of how compliance regulations apply to learners’ day-to-day work. By taking a more personalized approach, training coordinators encourage critical thinking and learning retention. With the responses gathered from live audience polling, training educators can bring regulatory guidance to life and focus their talking points on learners’ top concerns. In the past compliance training organizers have relied exclusively on end-of-course assessments to gauge learner understanding. Though compliance training sessions in theory require proper evaluation in order to be made more effective, training organizers often overlook this element of training delivery. Without interactive audience response systems, knowledge evaluation is difficult to do. With audience response systems, training educators are able to both identify and address learning gaps in real time. Training attendees can submit questions on hard to grasp concepts for presenters to address in the moment using a smartphone or tablet device. Regular pauses for Q&A illuminate what’s sticking in the minds of learners and what isn’t, ensuring no learner gets left behind. Instead of reserving Q&A for the end of compliance training sessions, learners share their questions that spark meaningful dialogue and make abstract concepts more relatable and memorable. With anonymous submission, the psychological barriers (ie. fear of judgement from boss or peers), which prevent attendees from asking questions are eliminated. 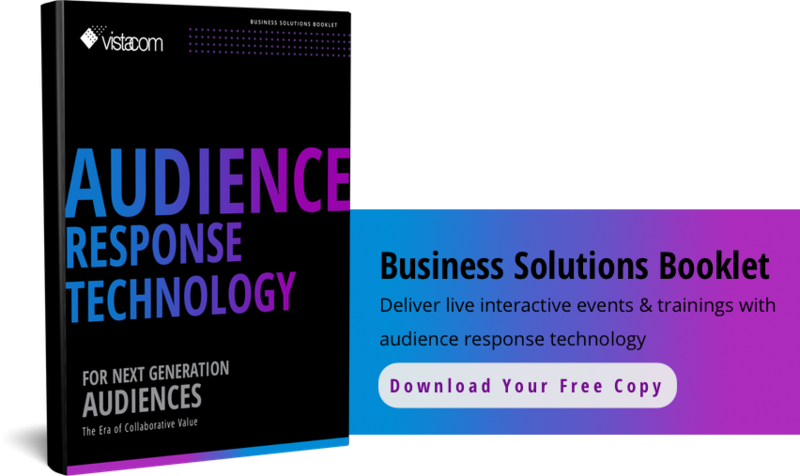 With interactive audience response systems, question submissions immediately become visible for attendees to ‘like’ to the top of training presenters’ question lists. Top crowd concerns are arranged by importance and displayed live on-screen for presenters without any coordination from session moderators. Elevating employees to play an active role in session discussions is vital to ensuring high learning retention and training satisfaction. With desktop-based presentation software, training educators can incorporate interactive teachable moments into training materials, which extend beyond end-of-course assessment quizzes. Collected data from live audience polling and Q&A engagement can be used to measure individual and team learning progression. Compliance training managers can upload employee information so that the participation and learning progression of each individual is tracked throughout the training session. With automated, real-time reporting, documentation is immediately available, and the evaluation of one-off and aggregate compliance training sessions is no longer cumbersome. A sound compliance training model ensures greater understanding and follow through on ever-changing regulations facing financial institutions. Many employee learning leaders are deploying interactive audience response tools to de-risk their educational compliance trainings by maximizing attendee engagement, learning retention and satisfaction.